KADE Stevens isn’t just worried about Henty’s Big Four in Saturday’s major semi-final at Walbundrie. 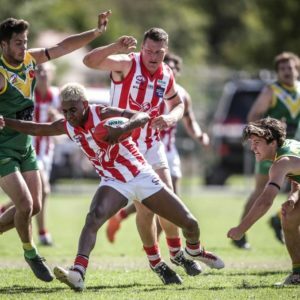 While Swampie stars Damian Cupido, Jarrah Maksymow and Daniel and Dale Cox have been stand-outs in their first season at the club, Stevens said it would be disrespectful to dismiss the remaining 17 players. “Their top four would certainly be as good if not better than most but they have quality depth as well,” Stevens said. “Obviously with their top four or so it puts them in the best side in the comp. 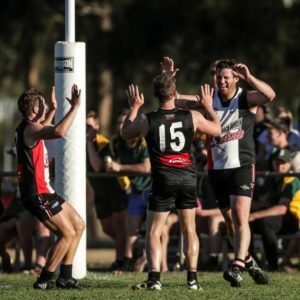 Henty beat Brock-Burrum by a point in round 10 at Brocklesby in a match that has been described as one of the best played in the league for years. The game had everything from a Cupido masterclass with eight goals to Jared Brennan’s debut to a controversial three-match suspension to Saints’ ruckman Matt Seiter. “It would be by far the quickest game I’ve played in during my time in the Hume league,” he said. “It was interesting that a lot of people said it was as good a game as they have seen in the league for a while. “A lot of people commented on how it probably deserved to be a draw. While Henty has declared Shannon Terlich and Beau Connell certain starters, the Saints are confident of welcoming back key players Matt Seiter, Jared Koschitzke, Jeremy Luff, Kade Garland, Ron Boulton and Luke Schilg. Luff tweaked a hamstring at training before round 15 and looks a lock to take on the toughest job in the league in holding Cupido. Cupido kicked a combined tally of 36 goals in Henty’s final four matches and Luff will do well to keep him to five or less. Boulton’s midfield grunt will also be vital as Brock-Burrum attempt to blunt the run and carry of Cox in the centre. “We’re confident we will get all six back for Saturday,” Stevens said. Henty and Brock-Burrum will have plenty of added motivation after both made inglorious exits during the first week of last year’s finals series. 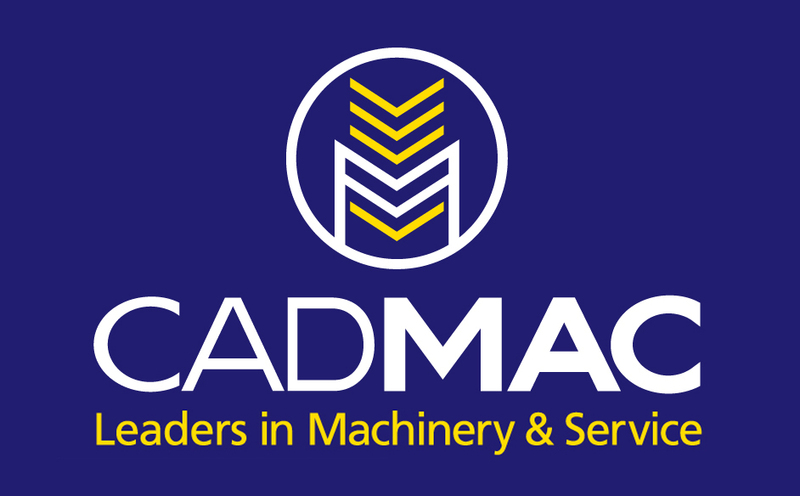 The Swampies lost to the Giants while the Saints were upset by Culcairn. HOLBROOK coach Matt Sharp believes the Brookers will have to improve on last weekend’s win to topple Jindera at Walbundrie on Saturday. In a clash between two of the league’s premier running sides, Sharp said his side couldn’t afford any lapses. “We probably dropped off in the second quarter and lost our way against Culcairn for a while,” Sharp said. Holbrook will need big games from experienced midfielders Josh Jones, Sam Harris, Sharp and Curtis Steele. Bulldog Ryan Speed is a good chance of standing Steele after playing on Matt Rava last weekend which would free up Sam Myors, Harry Weaven and Dylan Pettingill. Tom Weldon will also play in the midfield if not assigned Brooker forward Andrew Mackinlay. Jindera defeated Holbrook by 30 points in round nine.